Quote: "...all of a sudden there was this huge boom and all the glass started breaking and debris started falling from the sky." Quote: "Another eyewitness said the explosion sounded like, 'A big, big, big bomb.'" Quote: "Neighbors and workers in local businesses tell 7 Action News that the explosion could be heard and felt for several miles away." Quote: "Fire officials say they believe a car parked inside one of the sheds is where the fire began." Note: Check out Truro in Google Maps or whatever. You don't get much more coastal than that! Quote: "Contents of the barn – including a 1967 Oliver tractor with front loader, hay and straw – lost in the fire were valued at $25,000." Quote: "This is the second fire at a vacant home this week." Quote: "He said there had been no suspicious activity or noises from the room, and that he was going into the room to close an open window when he found them." Note: College student and 15? That's what it looks like anyway, from the story. Musta been one smart kid! Quote: "The Federal Aviation Administration received a distress call from the pilot saying he was losing his vision." Quote: "...she crashed into a median. Her vehicle then left the roadway and stopped near a safety fence above the Tri-Met MAX train tunnel..."
Note: Not my work; I take no credit. I'm not much of a video-maker person, but I can appreciate when other people are, and I think she (capricorn4455) did a good job of providing people with an overview in video format for those who prefer to get their info that way. Quote: "This fire is on a scale not seen for decades - the industry has seen nothing like it for between 30 and 50 years." Quote: "The blaze, which was first reported about 3 p.m., was burning inside a manhole near 210 2nd St. N., in a mostly commercial area of the North Loop neighborhood between Washington Avenue N. and the Mississippi River." Quote: "Along with the barn and RV, a truck that was stored in the structure was destroyed, as well as a tractor trailer parked close to the barn." Quote: "According to Police Chief Jim Batelli, an electrician installing a generator in the house had parked in the driveway near the home’s garage. After 1 p.m., he heard a popping noise, and saw that his van was fully engulfed in flames..."
Note: Popping noises have been heard at the site of many of the recent fires as they erupt. That sound is probably smallish gas plumes, hydrogen sulfide or methane or both, igniting after finding an ignition source. An ignition source isn't necessarily a flame either: hydrogen sulfide is reactive with numerous chemicals, rusty iron/steel and copper, among other things. The copper reactivity problem is likely the cause of many of the non-running vehicles spontaneously combusting these days in peoples' garages or driveways, boats at dock or on trailers, RVs and buses in storage lots or depots, vehicles inside auto shops, etc. 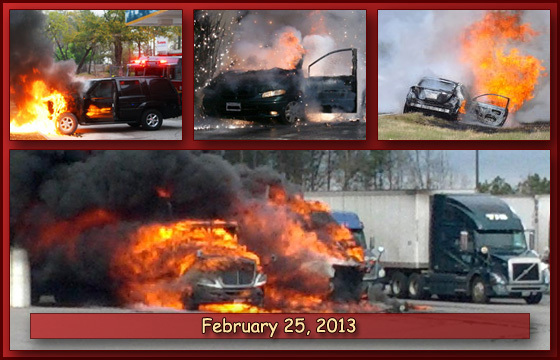 Quote: "'Something made that truck burn like that,' he said. 'I've done rebuilds. I've done crashes. 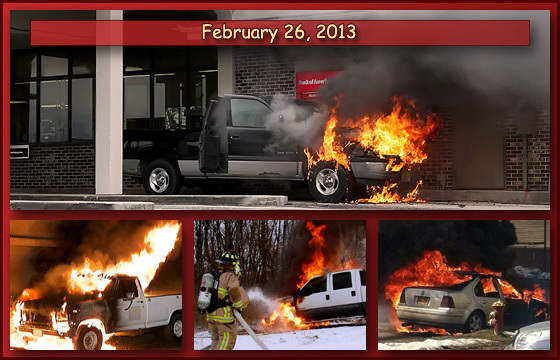 I've never seen a truck burn like that.'" Quote: "Fire investigators have determined that the fire was caused by a mechanical failure in one of the two vehicles that was parked inside the detached garage..."
Quote: "A Mercedes was destroyed in the blaze. Investigators say the fire started in the rear garage where that vehicle was parked..."
Quote: "...he lost three cars and a skid loader in the fire, including a mint-condition black-and-blue 1961 Falcon with only 5,000 miles on it." Quote: "Police is yet to ascertain whether they committed suicide by consuming poison or were killed." Quote: "Late last month, an engineering technician died while performing maintenance at the underwater test facility at the Army site." Quote: "KCAL9’s Stacey Butler said the man’s parachute reportedly didn’t open. Camp Pendleton officials, who said the incident marks the first time someone on active duty was killed during skydiving training..."
Note: I've been watching skydiving incidents for a bit now, and this isn't the first such incident, though it's apparently the first for Camp Pendleton Marines. I think in at least some cases the skydivers are being knocked unconscious by methane and/or hydrogen sulfide blowing through the atmosphere. Then they don't open their 'chute, and...splat. Quote: "...a preliminary investigation indicated the driver suffered a medical incident." Quote: "The explosion occurred at 300 meters (1,000 feet), as the balloon was flying over the west bank of the Nile opposite the city of Luxor..."
Quote: "Two witnesses told 6 News the explosions were so strong, they shook their homes." 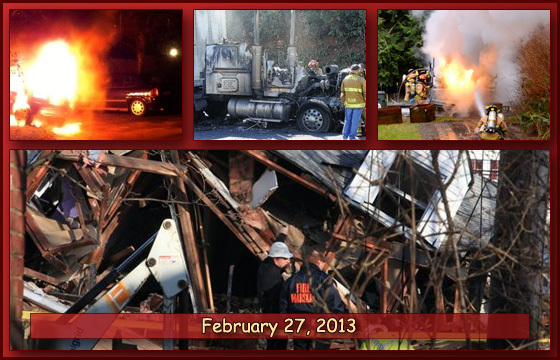 Quote: "No one was in the business when the fire started and no injuries were reported. A tanker truck, three vehicles, and either a boat or jet ski were destroyed." Quote: "Some vehicles and equipment were burned in the fire and there’s some smoke damage in the home." Quote: "A small barn was destroyed in a fire at Huntington Meadow Stables in Penfield Monday. This was the second fire at the stables since last Thursday when another barn located in the front of the property was destroyed by a fire." Quote: "Firefighters said the tenant of a nearby house called officials after he said he heard what sounded like an explosion and then saw the fire." Quote: "A bottlenose dolphin was found dead on Bang Tao Beach this morning, the first to be found beached in Phuket in years."